First Generation Rolex Oyster Tonneau Watch! Following the introduction of the first Rolex Cushion Oyster and Rolex Octagonal Oyster waterproof watches in circa 1927, Rolex introduced its first Tonneau-cased Oyster watch, in late 1933 / early 1934. These early examples followed the same design principals as the earlier Oyster cases and comprised of four main parts: The main case with lugs on either end, a separate central ring, and separate screw-down bezel and a screw-down case-back. The movement and dial are held in the separate central ring which has external threads at either end, secured inside the case body by the bezel on one side and the case-back on the other, tightened onto two soft metal seals. The screw-down crown comprises of a further three parts which complete the hermetic seal of the case. The watch you see here is a rare and early example of this design which was only produced for a short time as this construction was quite complicated and very expensive to produce. It was therefore replaced by a much simpler design in the late 1930s. The early generation Rolex Tonneau Oyster here, in 9ct yellow gold, measures 32mm in diameter, not including the original Rolex Oyster screw-down crown. This may sound small, but this was the standard size for all Oyster-cased watches until 1949 when the 34mm Rolex Oyster case was introduced. The large screw-down winding crown also adds another 4mm to the overall width of the case. The case is immaculate from every angle. There are no scratches, dings or any other marks visible to the naked eye. Even the knurling on the case-back is crisp and free of damage. The finish on the case body and case-back looks like new! It is only when the inside of the screw-down case-back is revealed, are we reassured that this is an 80 plus-year-old watch. All the markings are perfectly correct, signed R.W.C. for Rolex Watch Co., and ‘Oyster Watch Co.’ and ‘Geneva Swiss’. We also have Glasgow UK 9ct hallmarks from 1935. For reasons of their own, Rolex hallmarked most, if not all, of their early Oyster cases in Glasgow during the 1920s and 1930s. The text then claims 31 World Records! (for accuracy and reliability) There are then British, Swiss, French, U.S.A. and German Patent stamps along with the very clear external case number 34767. Please also note, the water resistance of this watch has not been tested and it is not guaranteed. As always, our standard advice applies: vintage watches should be kept clean and dry at all times. The Rolex Cal.10½, 17 Jewel hand-wound movement here, has the ‘Extra Prima’ designation, which was more accurate than the standard ‘Prima’ version. As can be seen in the close-ups, this movement is in beautifully clean and sparkling condition with not even the slightest evidence of abuse or damage in the form of poor servicing or water ingress. The movement has received a full overhaul and service by our vintage Rolex specialist Watchmaker and when tested on our electronic test machine, following careful calibration, the watch movement was running at +9 seconds/day. 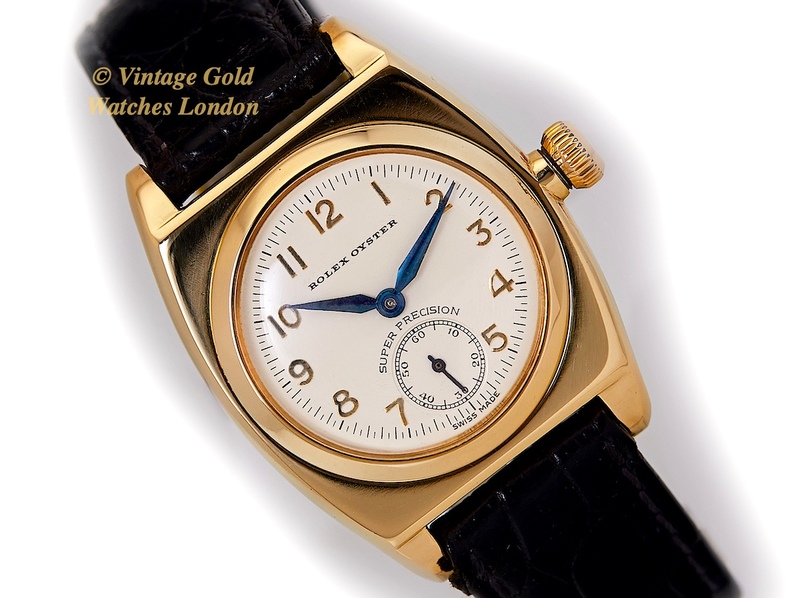 This is outstanding for any vintage watch, let alone one past its 80th birthday! We are confident that with continued proper care, this watch movement will run accurately and reliably for many more generations to come. We therefore have no hesitation in offering this watch for sale with our 12 months’ warranty. However, while this watch was designed for daily use, due to its age and tip-top condition, we would recommend occasional use only. The Silver-White dial carries applied 1 – 12 standard Arabic yellow gilt numerals, paired with the most beautiful original, restored blued steel ‘Lance’ hands. The dial is signed both ‘Rolex Oyster’ and ‘Super Precision’. The strap fitted is a new high quality Black ‘Croc’ leather strap, with a matching Rolex gold plated buckle. We feel this nicely matches the watch, however, if a different style or colour or style of strap is preferred, please let us know and we will do our best to oblige, free of any extra charge. We carry tan, conker, dark brown burgundy and black in stock, in plain padded leather, alligator, crocodile skin or lizard skin. Although there is no original paperwork with this watch, the reference numbers, markings, signatures, and hallmarks all match and are correct for this watch, dating it to circa 1935. The high quality hardwood presentation box shown in the photographs is included.